More than 100 people attended an open house on Thurs., Jan. 21, for Winship Cancer Institute of Emory University’s new community Medical Oncology and Hematology Department at Emory Johns Creek Hospital (EJCH). "We’ve seen miracles here, we’ve seen tragedy; and throughout all of this we’ve seen care, love and compassion," says Marilyn Margolis, CEO of Emory Johns Creek Hospital. Winship’s Medical Oncology and Hematology Department began operating full-time at EJCH in Nov. 2015. It’s the largest oncology-related department at Emory University’s School of Medicine. The department was established in Feb. 2008. Winship offers cutting-edge care in Johns Creek and eligible patients will have access to over 250 clinical trials. Emory University Hospital Midtown CEO, Daniel Owens, expressed his appreciation for the employees and the community’s support to expand the department. Owens oversees all infusion services throughout Emory Healthcare. "We look forward to bringing world class care to communities and this is just the start to our growth of Winship," says Owens. Attendees toured the new unit and also heard remarks from Bruce Goldsweig, MD, medical director of infusion services for EJCH and assistant professor, Department of Hematology and Medical Oncology for Emory University School of Medicine; Greg Robertson,MD, Emory Heart and Vascular Center Director, EJCH Cath Lab Medical Director, associate professor of medicine, Emory University School of Medicine; and Seth Rosen, MD, assistant professor of surgery, Division of Surgical Oncology, Emory University School of Medicine. Patients, staff and community members also visited other departments, including: surgical oncology, ambulatory infusion, breast imaging, cardiovascular and thoracic surgery. 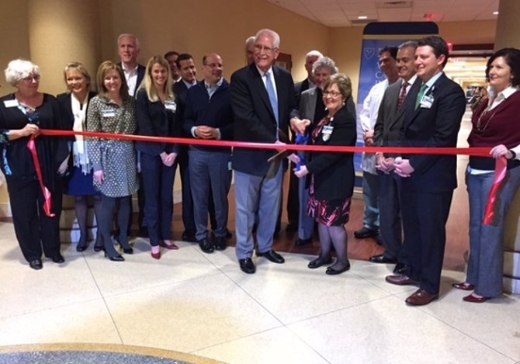 The president of the Johns Creek Chamber of Commerce, John Bemont, Johns Creek Mayor Pro Tem, Steve Broadbent and other hospital staff joined Margolis for the ribbon cutting of the new unit. "It’s incredibly impressive that Winship is the only National Cancer Institute-designated center in Georgia," says Broadbent. The center’s unit director, Connie Masters, RN, says she’s seen exponential growth since the center opened in 2012. Masters says the numbers doubled last year. "We treated 400 patients in May of 2015 and 854 patients in Nov. 2015," says Masters. infusion, chemotherapy infusions and injections, blood and blood product transfusions, intravenous medication treatments, phlebotomy, antibiotic therapy, hydration and lab draws.